Burnt Timber Lifting Solutions is a full service provider of mini-cranes, compact tracked man-lifts, and other specialty lifting equipment and tools that allow you to work safely, effectively and efficiently in small, limited clearance and restricted access spaces. We provide sales, rentals, parts, service and proper training for all the lifting equipment we sell. Whether you need a mini-crane to lift something, or a compact tracked man-lift to give you access, we can provide the equipment and experience to get the project completed safely, efficiently and on time — all while saving you both equipment and labour costs. Our mini-cranes and man-lifts have been purpose-built with lift points that enable them to be safely lifted or lowered in whatever area they are required. The key is their small size and weight, which allows them to gain access through existing doorways, backyards, alleys, gates and hallways to complete required tasks. Traditional cranes and man-lifts are often too big and heavy to be used where these incredible machines can operate. Ideal for use indoors and outdoors, mini-cranes allow for better, closer access than larger capacity cranes. 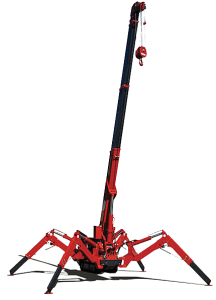 Compact tracked man-lifts provide superior and easy access never before possible without scaffolding or crane suspended man-baskets. All of our equipment can be used in a multitude of locations that used to require expensive, time-consuming, manual labor options to perform the task — inside buildings, in backyards, garages, mechanical rooms, foyers, malls, theatres, hospitals, etc.